Katy Elsam is studying a BSc Geography. She says she chose UCL because of its global reputation and London location. Once she’s completed her Undergraduate Programme, Katy is continuing on to a Masters in Climate Change. “UCL is one of the best universities in the world, and the Geography Department is outstanding. I did my research before choosing where to go. I knew that I wanted to be in a lively city, full of opportunities, hence why I chose a university based in central London. The course offers a broad range of topics and I loved the fact that people in the Department are leading experts in their respective fields. Besides the academic aspects, I saw that UCL offered a huge variety of sports, societies, events and opportunities to further my undergraduate experience. 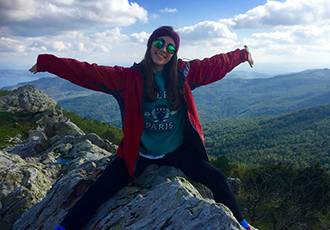 “My degree focuses on the physical side of Geography, covering a diverse selection of topics from paleoclimatology studies to managing freshwater ecosystems. I hope to come out of my Programme with a deeper understanding of the intricate interdependencies of the climate system, and recognise the crucial role that humans play within this. UCL’s Geography Department creates critical, free-thinkers. I hope that I will be able to take this attribute and apply it to all aspects of my life. “The fieldtrip to Lesvos in my 3rd year was by far the best week of my degree. It brought together all the theory learnt over the past 3 years, and put it into practice using new and old field techniques. It emphasised, for me, that we cannot separate parts of the climate system, as they are all interlinked. Furthermore, the role that we as humans play in this is undeniably important. I also loved the COP21 seminar run as part of GEOG3057, which inspired me to get involved in the wider debates of COP21 and our global climate negotiations. “I have been part of both the Mallorca fieldtrip in second year, and the Lesvos fieldtrip in third year. My group project in Mallorca involved taking depth measurements of a lake to map the bathymetry using a GIS. In Lesvos I undertook many different, smaller projects such as taking tree cores at different altitudes on a mountain, and also coring a lake and finding a tephra horizon (volcanic ash fallout) from an eruption 21,000 years ago! “As well as the practical research methods from fieldwork exercises, group projects produce excellent team work skills and have shown me how to cultivate the potential in individuals within a group. I feel like a much more independent, confident, and able person with improved communication, thinking, analysis, and understanding of the world around us. “I want to further my understanding of the many and varied topics that I have explored so far in my undergraduate degree. I hope to undertake a Master’s degree at UCL, with particular consideration into the MSc Climate Change.